Goodluck Jonathan has become Badluck Jonathan. Just take a look at the budget for the President's personal food bill. Why did people think Jona was going to be different again? Dude don play naija people 419. I want to sit here and scream "enough is enough"! 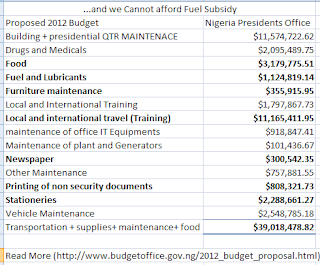 How many more innocent souls are going to die over this fuel subsidy business? Are our voices going to be heard or will Badluck turn into another Abacha? What was he thinking when he decided to do remove the fuel subsidy? Was he thinking? Has living in Aso Rock made him forget the reality of an average Nigerian? What is going on in Nigeria? Let's put our voices together and hope we will be heard. Enough is enough. I am seriously getting scared for Nigeria. First we have to deal with Boko Haram, now this. As suggested by Adura Ojo (Naijalines) here's what you can do to help. 1. 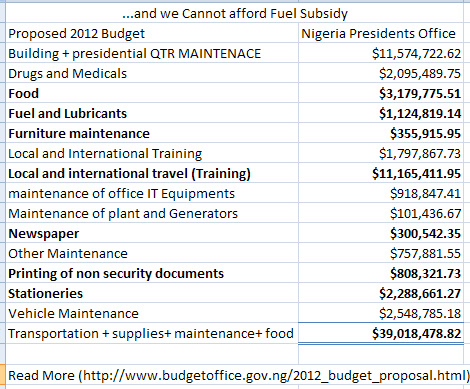 Do a similar post of your own on your blog using the title "GEJ Presidential Palace Subsidy Must End: Nigerian Bloggers' Protest"
4. Please allow for seven days on your blog or place in a prime position on your blog for seven days. 5. You can still play your part as a non-blogger: share on facebook, twitter and other relevant social media. 6. Journalists, use your media space. Just did. And it felt so good. The way our politicians live is more than selfish. The way we have allowed our politicians live is treasonable. Thank you for joining the campaign. I've been MIA as my daughter went into hospital yesterday for two ENT procedures and we were there the whole day. She is recovering at home now and will be off school for at least two weeks. I will spend some time today 'recruiting' more of our beautiful bloggers and hope you can do this too. Thank you for all the good work you do in our blogging community. It is well appreciated. I would have loved to join the protest taking place in London tomorrow but I'm unable to as I need to be at home with Tomtom. I will follow on the news and facebook. BTW, Naija 'agents' are trying to stop our blogging campaign by putting a malware warning on some blogs. I hope it does not put people off reading our blogs. It's a false warning to deter people from reading the blog. I bypassed it and nothing happened - it's just a ruse. But of course a lot of readers won't know this. We need to get the message out there for readers to ignore the malware warning. It's an empty threat. @Adura i saw the malware message on your blog, i bypassed it too cos i have anti malware you mean...smh..this is serious o !